By default, the DupScout service is configured to run under the local system account, which is good to search duplicates in local disks and directories. On the other hand, the local system account does not have permissions to access network shares and NAS storage devices. In order to enable DupScout Server to search duplicate files in network shares and NAS storage devices, the DupScout service should be configured to run under a user account, which has permissions to access files and directories located on the required network shares. Open the Services control center and find here the 'Dup Scout Server' service. Open the 'Dup Scout Server' service, select the 'General' tab and stop the service. Select the 'General' tab and start the 'Dup Scout Server' service. 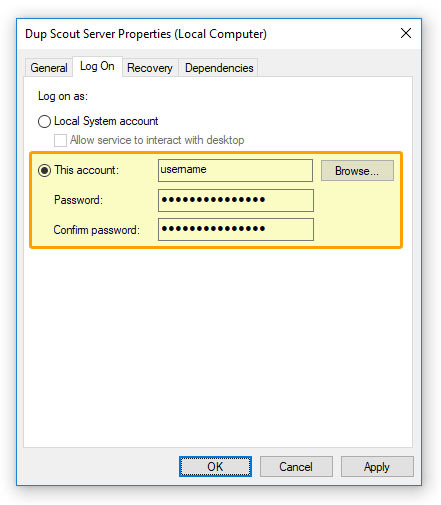 Now, the DupScout service will run under the specified user account and will have exactly the same permissions as the specified user account when accessing network shares and NAS storage devices. Sometimes, it may be required to search duplicate files in multiple network shares and NAS storage devices in different domains using different user accounts. In order to connect to a network share with a custom user name and/or password, select the menu 'Tools - Connect Network Drive', enter the name of the network share to connect to and specify the user name and password to use. When searching duplicate files in tens of network shares and NAS storage devices, it may be not convenient to assign a drive letter for each connected network share just because there may be not enough letters to assign to all the required network shares. For such cases, the user is provided with the ability to connect network shares without assigning drive letters. 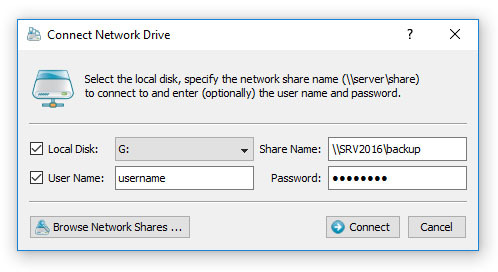 In order to connect a network share without assigning a drive letter, unselect the 'Local Disk' check box on the network share configuration dialog. DupScout Server provides the ability to configure periodic duplicate files search operations to be executed fully automatically in the background. In order to enable automated periodic duplicate files search operations in network shares and NAS storage devices, DupScout allows one to pre-configure a list of network shares to be automatically connected during the server startup. The user is provided with the ability to specify an unlimited number of network shares to connect to and optionally configure custom login credentials for each specific network share. In order to pre-configure one or more network shares, select the 'Tools - Manage Network Shares' menu item, press the 'Add' button and specify all the required parameters.